Natallia is coming along very well with her watercolors. We’ve been adding more color to her uniforms which, in my view, adds nice complexity and depth. You might remember Jack Barry as the longtime shortstop, mainly for the Athletics. Over eleven seasons he only managed a .243 batting average but no one can deny that he knew how to win. 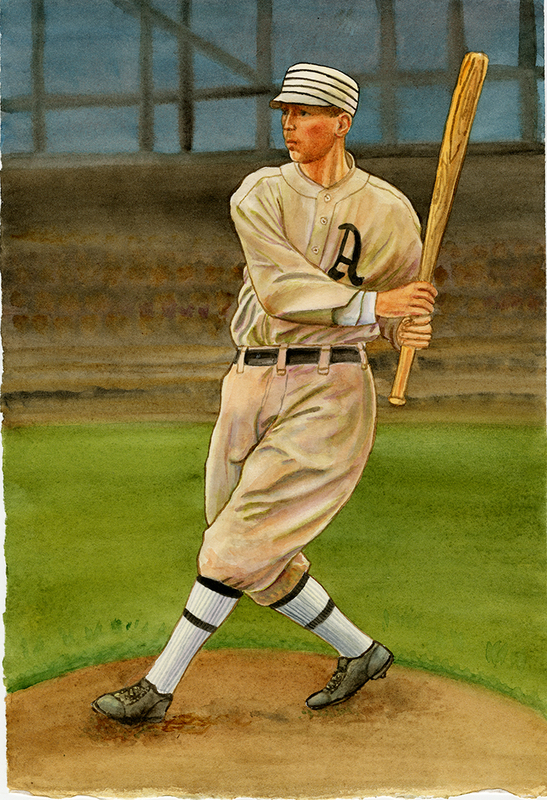 His A’s teams won World Series Championships in 1910, 1911 and 1913. They also appeared in the 1914 World Series but the incredible Boston Braves were not to be denied. Boston swept the more polished team in just four games. Connie Mack broke up the team over the winter and Barry was sold to the Boston Red Sox. He took his winning ways with him and that very season saw Boston in the World Series against the Philadelphia Phillies and their ace, Grover Cleveland Alexander. Boston took the series in five. This blog is about vintage and hand-made baseball cards, art, brewing and cigars, history and anything interesting that I think should be passed along. Come often, you are welcome!